Ancient Rome boasted impressive technological feats, using many advances that would be lost in the Middle Ages. These accomplishments would not be rivaled until the Modern Age. Many practical Roman innovations were adopted from earlier designs. Roman road system, outstanding transportation network of the ancient Mediterranean world, extending from Britain to the Tigris-Euphrates river system and from the Danube River to Spain and northern Africa.In all, the Romans built 50,000 miles (80,000 km) of hard-surfaced highway, primarily for military reasons. Via Appia (Appian Way), begun by the censor Appius Claudius Caecus in 312 bce, originally ran southeast from Rome 162 miles (261 km) to Tarentum (now Taranto) and was later extended to the Adriatic coast at Brundisium (now Brindisi). 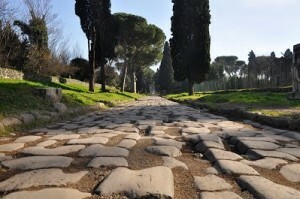 Via Latina, running southeast and joining the Via Appia near Capua. 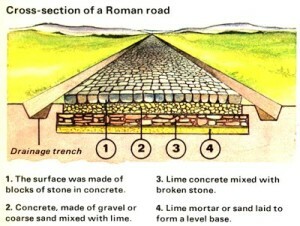 The Roman roads were notable for their straightness, solid foundations, cambered surfaces facilitating drainage, and use of concrete made from pozzolana (volcanic ash) and lime. Though adapting their technique to materials locally available, the Roman engineers followed basically the same principles in building abroad as they had in Italy. In 145 bce they began the Via Egnatia, an extension of the Via Appia beyond the Adriatic into Greece and Asia Minor, where it joined the ancient Persian Royal Road. In northern Africa the Romans followed up their conquest of Carthage by building a road system that spanned the south shore of the Mediterranean. In Gaul they developed a system centred on Lyon, whence main roads extended to the Rhine, Bordeaux, and the English Channel. In Britain the purely strategic roads following the conquest were supplemented by a network radiating from London. In Spain, on the contrary, the topography of the country dictated a system of main roads around the periphery of the peninsula, with secondary roads developed into the central plateaus. The Roman road system made possible Roman conquest and administration and later provided highways for the great migrations into the empire and a means for the diffusion of Christianity. Despite deterioration from neglect, it continued to serve Europe throughout the Middle Ages, and many fragments of the system survive today. Via terrena: A plain road of leveled earth. Via glareata: An earthed road with a graveled surface. Via munita: A regular built road, paved with rectangular blocks of the stone of the country, or with polygonal blocks of lava. 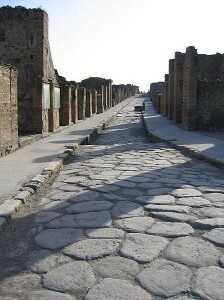 The Romans are believed to have inherited the art of road construction from the Etruscans. No doubt the art grew as it went along and also incorporated good ideas from other cultures. After the architecti looked over the site of the proposed road and determined roughly where it should go, the agrimensores went to work surveying the road bed. They used two main devices, the rod and one called the groma, which helped them obtain right angles. 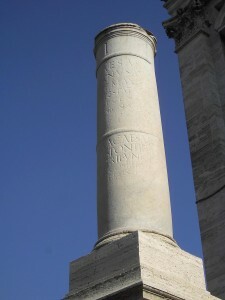 The gromatici, the Roman equivalent of rod men, placed rods and put down a line called the rigor. As they did not possess anything like a transit, an architect tried to achieve straightness by looking along the rods and commanding the gromatici to move them as required. Using the gromae they then laid out a grid on the plan of the road. The libratores began their work. Using ploughs and legionaries with spades, they excavated the road bed down to bed rock or at least to the firmest ground they could find. The excavation was called the fossa, “ditch.” It was typically 15′ below the surface, but the depth varied according to terrain. The road was constructed by filling the ditch. The method varied according to geographic locality, materials available and terrain, but the plan, or ideal at which the architect aimed was always the same. The roadbed was layered. Into the fossa was dumped large amounts of rubble, gravel and stone, whatever fill was available. Sometimes a layer of sand was put down, if it could be found. When it came to within a few feet of the surface it was covered with gravel and tamped down, a process called pavire, or pavimentare. The flat surface was then the pavimentum. It could be used as the road, or additional layers could be constructed. A statumen or “foundation” of flat stones set in cement might support the additional layers. The final steps utilized concrete, which the Romans had exclusively rediscovered. They seem to have mixed the mortar and the stones in the fossa. First a several-inch layer of course concrete, the rudus, then a several-inch layer of fine concrete, the nucleus, went onto the pavement or statumen. Into or onto the nucleus went a course of polygonal or square paving stones, such as you see in the picture, called the summa crusta. The crusta was crowned for drainage. It is unclear that any standard terminology was used; the words for the different elements perhaps varied from region to region. 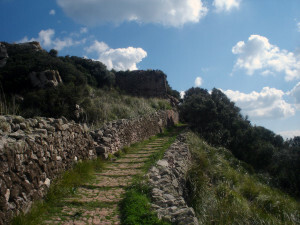 An example is found in an early basalt road by the Temple of Saturn on the Clivus Capitolinus. It had travertine paving, polygonal basalt blocks, concrete bedding (substituted for the gravel), and a rain-water gutter. Today the concrete has worn from the spaces around the stones, giving the impression of a very bumpy road, but the original surface was no doubt much closer to being flat. These remarkable roads are resistant to rain, freezing and flooding. They needed little repair. Roman architecti preferred to engineer solutions to obstacles rather than circumvent them. River crossings were achieved by bridges, or pontes. Single slabs went over rills. A bridge could be of wood, stone, or both. Wooden bridges were constructed on pilings sunk into the river, or on stone piers. Larger or more permanent bridges required arches. Roman bridges were so well constructed that many are in use today. Causeways were built over marshy ground. The road was first marked out with pilings. Between them were sunk large quantities of stone so as to raise the causeway 6 feet above the marsh. In the provinces, the Romans often did not bother with a stone causeway, but used log roads (pontes longi). Outcroppings of stone, ravines, or hilly or mountainous terrain called for cuttings and tunnels. Roman roads generally went straight up and down hills, rather than in a serpentine pattern. Grades of 10%-12% are known in ordinary terrain, 15%-20% in mountainous country. Milestones divided the via Appia even before 250 BC into numbered miles, and most viae after 124 BC. The modern word “mile” derives from the Latin milia passuum, “one thousand paces”, which amounted to 4,841 feet (1,480 m). A milestone, or miliarium, was a circular column on a solid rectangular base, set for more than 2 feet (60 cm) into the ground, standing 5 feet (1.50 m) high, 20 inches (50 cm) in diameter, and weighing more than 2 tons. At the base was inscribed the number of the mile relative to the road it was on. In a panel at eye-height was the distance to the Roman Forum and various other information about the officials who made or repaired the road and when. These miliaria are valuable historical documents now. Their inscriptions are collected in the volume XVII of the Corpus Inscriptionum Latinarum. An aqueduct is a water supply or navigable channel constructed to convey water. The word is derived from the Latin aqua (“water”) and ducere (“to lead”).The Romans constructed aqueducts to bring a constant flow of water from distant sources into cities and towns, supplying public baths, latrines, fountains and private households. Waste water was removed by the sewage systems and released into nearby bodies of water, keeping the towns clean and free from noxious waste. 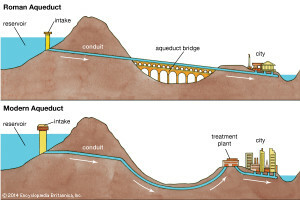 Some aqueducts also served water for mining, processing, manufacturing, and agriculture. Rome’s first aqueduct supplied a water-fountain sited at the city’s cattle-market. By the 3rd century AD, the city had eleven aqueducts, to sustain a population of over 1,000,000 in a water-extravagant economy; most of the water supplied the city’s many public baths. Most Roman aqueducts proved reliable, and durable; some were maintained into the early modern era, and a few are still partly in use. 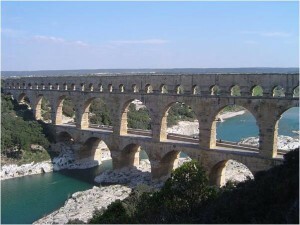 Methods of aqueduct surveying and construction are given by Vitruvius in his work De Architectura (1st century BC). The general Frontinus gives more detail, in his official report on the problems, uses and abuses of Imperial Rome’s public water supply. 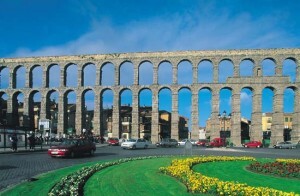 Notable examples of aqueduct architecture include the supporting piers of the Aqueduct of Segovia, and the aqueduct-fed cisterns of Constantinople. what were the detection tools ? To achieve a consistent, shallow slope to move the water in a continuous flow, the Romans lay underground pipes and constructed siphons throughout the landscape. Workers dug winding channels underground and created networks of water pipes to carry water from the source lake or basin into Rome. The pipes were typically built in concrete, but were sometimes made of lead when the government provided enough cash (lead was very expensive in 300 B.C.). When the pipes had to span a valley, they built a siphon underground: a vast dip in the land that caused the water to drop so quickly it had enough momentum to make it uphill. At certain points along the route, sedimentation tanks removed impurities from the water. In other sections, access points were carved into the system so maintenance workers could access the pipes. One way the engineers facilitated maintenance was by running two pipes alongside each other and diverting water between the two so men could get inside one pipe at a time. The longest of the aqueducts, Anio Novus, was nearly 60 miles (97 km) in length. how were acqueduct bridges built? Conduits could be supported across valleys or hollows on arches of masonry, brick or concrete. The Pont du Gard, one of the most impressive surviving examples of a massive masonry multiple-piered conduit, also served as a road-bridge. Where particularly deep or lengthy depressions had to be crossed, inverted siphons could be used instead; here, the conduit terminated in a header tank which fed the water into pipes. These crossed the valley at lower level, supported by a low “venter” bridge, rose to a receiving tank at a slightly lower elevation and discharged into another conduit; the overall gradient was maintained. Siphon pipes were usually made of soldered lead, sometimes reinforced by concrete encasements or stone sleeves. Less often, the pipes themselves were stone or ceramic, jointed as male-female and sealed with lead. Vitruvius describes the construction of siphons and the problems of blockage, blow-outs and venting at their lowest levels, where the pressures were greatest. Nonetheless, siphons were versatile and effective if well-built and well-maintained. A horizonal section of high-pressure siphon tubing in the Aqueduct of the Gier was ramped up on bridgework to clear a navigable river, using nine lead pipes in parallel, cased in concrete. Modern hydraulic engineers use similar technique to enable sewers and water pipes to cross depressions. The Romans had a complex system of sewers covered by stones, much like modern sewers. Waste flushed from the latrines flowed through a central channel into the main sewage system and thence into a nearby river or stream. However, it was not uncommon for Romans to throw waste out of windows into the streets, at least according to Roman satirists. Despite this, Roman waste management is admired for its innovation. 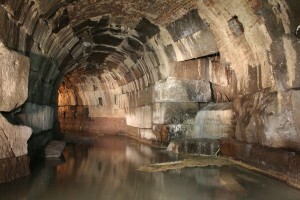 It is estimated that the first sewers of ancient Rome were built between 800 and 735 BC. Drainage systems evolved slowly, and began primarily as a means to drain marshes and storm runoff. The sewers were mainly for the removal of surface drainage and underground water. The sewage system as a whole did not really take off until the arrival of the Cloaca Maxima, an open channel that was later covered, and one of the best-known sanitation artifacts of the ancient world. Most sources believe it was built during the reign of the three Etruscan kings in the sixth century BC. This “greatest sewer” of Rome was originally built to drain the low-lying land around the Forum. It is not known how effective the sewers were, especially in removing excrement. Over time, the Romans expanded the network of sewers that ran through the city and linked most of them, including some drains, to the Cloaca Maxima, which emptied into the Tiber River. The Cloaca Maxima was built in the fourth century BC, and was largely reconstructed and enclosed under the authority of Agrippa as an aedile in 33 BC . It still drains the Forum Romanum and surrounding hills. The Romans recycled public bath waste water by using it as part of the flow that flushed the latrines. Terra cotta piping was used in the plumbing that carried waste water from homes. The Romans were the first to seal pipes in concrete to resist the high water pressures developed in siphons and elsewhere. Beginning around the 5th century BC, city officials called aediles supervised the sanitary systems. They were responsible for the efficiency of the drainage and sewage systems, the cleansing and paving of the streets, prevention of foul smells, and general oversight of brothels, taverns, baths, and other water supplies. In the first century AD, the Roman sewage system was very efficient. In his Natural History, Pliny remarked that of all the things Romans had accomplished, the sewers were “the most noteworthy things of all”.